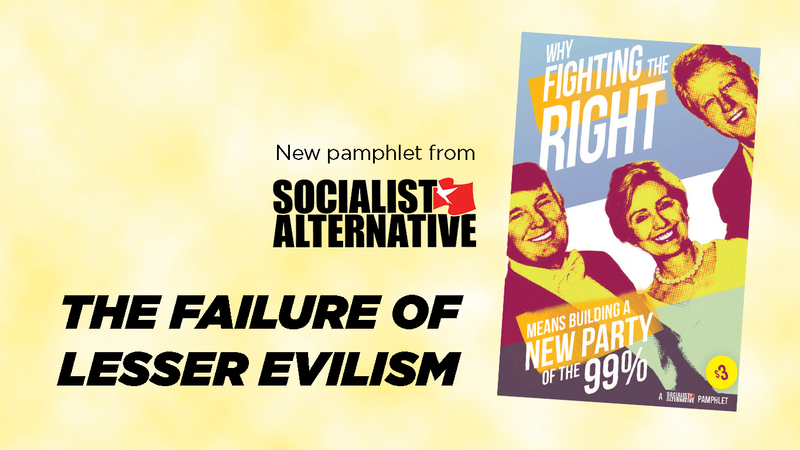 The Failure of Lesser Evilism – New Pamphlet! Most people recognize that our political system is broken: The two capitalist parties have produced a presidential election between the two most unpopular candidates in living memory. Millions watch in disbelief as a billionaire bigot appears to be within striking distance of the White House. Meanwhile, there is huge anger and distrust for Clinton’s corporate campaign. The Democratic Party establishment’s sidelining of Bernie Sanders — still the most popular politician in America — shows that they are more committed to Wall Street and big business than to defeating Trump and the Republicans. How can we build a movement to cut across the rise of right-wing populists? Is it possible to build a new mass party of the 99%, completely independent of corporate corruption? 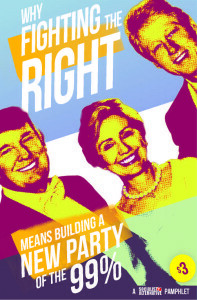 This pamphlet makes the case for building a left political alternative to the Democratic Party, and answers the arguments of those backing Clinton as the “lesser evil” to Trump. Read full text of the pamphlet here.